Hoot hoot, here's a bunch of cute owls for you to color! Colorists of all ages will adore these 31 whimsical illustrations of owls - perched on branches, surrounded by flowers, silhouetted against backdrops with crescent moons, and nestled into other fun-to-color settings. Pages are perforated and printed on one side only for easy removal and display. 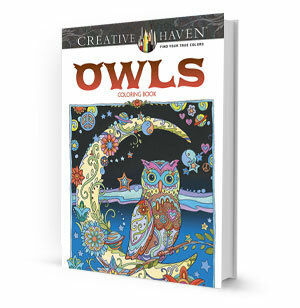 Specially designed for experienced colorists, this Creative Haven Owls Coloring Book offers an escape to a world of inspiration and artistic fulfillment.